Apple is still selling iPods, but why? MacDailyNews Take: That is patently, laughably incorrect. 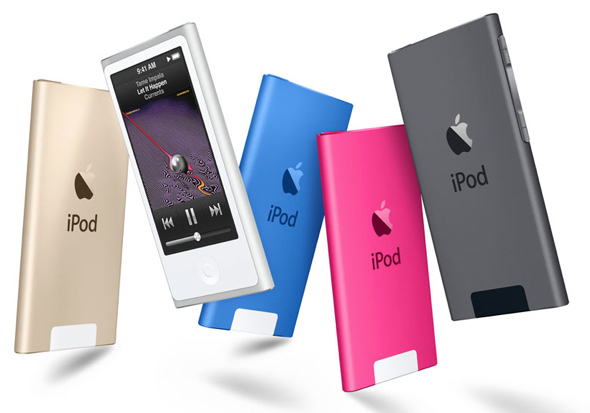 iPod nano has a display and both iPod nn and iPod shuffle allow users to select the songs they want to hear. MacDailyNews Take: “Apple is still selling iPods, but why?” They still have stock and will sell them until stock runs out. iPod lovers, you can still get iPods today, but get ’em while they last! So, what do yo think about iPod touch? Not long for this world or sticking around? Isn’t it still the perfect “starter iPhone” for kids too young to have an iPhone? Because everyone doesn’t need a cell phone or want a data contract. Because they have warehouses full of them. Mismanagement Timmy wouldn’t have warehouses full of them if he refreshed his iPod and Mac hardware every 2-3 years. I have found that Apple’s beancounters are driving to make everyone buy into always-connected thin clients with rental services. I have a lot of music, and I enjoy audiobooks and podcasts during travel when offline. Or I should say i used to before iTunes became an error laden slow mess. If Apple is too lazy to keep iTunes, Macs, and iPods working together seamlessly the way they used to, then some of us will have no choice but to go elsewhere. My son used an iPod for years. You can’t go anywhere these days and not find a free WiFi hotspot. Get a MagicJack and make as many calls you want without any data contracts. It works great for kids and you don’t need to pay ridiculous mobile fees or worry about overages. Of course now that he is 16 and driving he now has a regular iPhone but I am happy that I saved hundreds of dollars. I was even able to buy him some Apple stock over the years. In my opinion, I have NEVER paid for an Apple product because of the profits that I have made. Just my 2¢ and common sense. how do u use a Magic Jack with the iPod Touch? He means get a magic jack for you home line, and use the iPod touch on the wireless connection of that voip phone line. It could have been a little bit better described. Magic Jack has an app. No need to waste $100+ per month on cellphone data when an iPod Touch will serve your needs using Wi-Fi. iPod Touch is essentially an iPad with a much smaller form factor. Perhaps re-brand it with a name like iPad Nano or iPad Micro, or something associating it with the iPad. Why is this question being asked? Is it because this person thinks that no one will actually go out and buy an iPod or is that they believe Apple is just wasting their time trying to sell them? Apple must clearly know the reason why they’re still offering iPods to consumers. Surely, it must be worthwhile to Apple for some reason to continue selling them. I really don’t see how an iPod Touch could be considered an obsolete product. It might be a bit expensive but I think it still can be useful. If a person has an iPhone with limited storage capacity, the iPod Touch would seem to be a good backup device for carrying around music or videos. It’s a shame it only comes with 128GB of storage considering the iPod Classic had 160GB of storage. Although the iPod isn’t cutting edge tech, it still seems like a solid product to me. Should Apple really drop every product that doesn’t produce tremendous sales? I’m curious as to how many iPods are being sold each year. A million, maybe? I use my iPod nearly everyday, sweating in the “south” and I’d rather wreak an $150 device than one costing $700-1000 (ph). I’m speaking of a nano, which is markedly lighter/smaller than a Touch. Yes, the Watch is a replacement, but it binds me to wireless headphones…more expensive and another thing to charge. Til the last one is sold, then que the sad music, shrinking spotlight, and guy mopping the floor. People still like dedicated music devices and would buy new iPod models if Apple leaders got off their asses and updated them. Current owner of iPod shuffle, nano, and touch. One for workouts, one for travel, one docked in the car. All overdue for replacement without an improved model offered by Apple. Mismanagement on display. I am not sure about the other models, but for the iPod Touch I know the main reason is usually the difference in affordability compared to an iPhone’s monthly service charges. For example, your 6 year old may want their own iPhone with their own games and apps, but don’t need a cell phone. It’s better to get the child an iPod Touch until they can actually make use of a cellular device. I wouldn’t mind seeing an iPhone nano option, especially now that you can share a single phone number among multiple devices. For certain situations, an iPod nano is the perfect form factor.